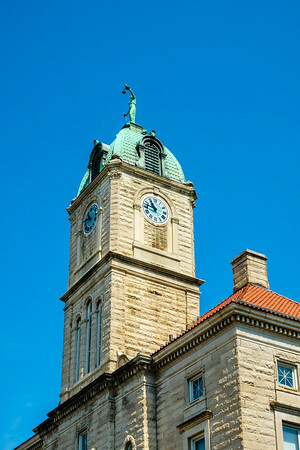 The Rockingham County Courthouse is located on a square in the center of Harrisonburg, Virginia. It was built in 1897 and is the fifth such building to be located on this prominent site in the center of town. Rockingham County was formed in 1788 from Augusta County to the north. Harrisonburg was named for Thomas Harrison who in 1737 settled in the Shenandoah Valley. Harrison eventually laid claim to over 12,000 acres surrounding the junction of the Spotswood Trail, now US Route 33, and the main Native American road through the valley which would in time become US Route 11, also known as the Valley Pike. 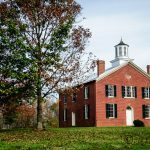 In 1779, Harrison deeded 2.5 acres right at the junction of two main roads for the construction of a courthouse. 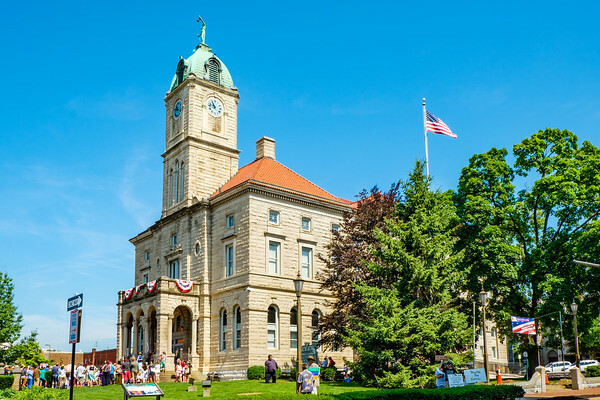 The following year Harrison deeded a further 50 acres surrounding the courthouse for the development of the town which has now become the Harrisonburg Downtown Historic District. Most Virginia county seats developed from rural villages and have a quite linear structure with no obvious center on which to locate the main public building. Harrisonburg’s Court Square, being the center of the land donated by Thomas Harrison, puts the Rockingham County Courthouse in the prominent position it deserves. When the fourth courthouse fell into disrepair and the estimates to renovate the building proved too expensive, the county requested bids for a replacement. The winning design was submitted by T.J. Collins. Collins, although without formal training, came from a distinguished family of architects. His grandfather, John Collins of Washington, won second prize in the White House design competition in 1792. T.J. Collins seemed to rely on current publications for the basis of his designs. In 1892 a design for the US Court in Wilmington, Delaware appeared in the Annual Report of the Supervising Architect of the US Treasury. Collins used this as the start of the design for the Rockingham County Courthouse. He had a personal preference for French Renaissance and Richardson Romanesque elements, both of which are prominent in the design. Collins added his own touches, specifically the triple arched portico with the heavy balustrade protecting the front doors. This portico design appears in a five-arch form on the two side elevations. The three-and-one-half story building has a two-stage tower rising up above the entrance. Collins design differs significantly from the Wilmington building in the design of this tower. Although both are two stage with the clock on the upper, that is about as far as the similarities go. Three narrow, round-arched windows in the first stage of the tower echo the portico below. Above this sits the four clock faces situated within stone arched panels. The tower is topped with a domed, tiled roof with ventilation opening encased in arches. The final element is, appropriately, a statue of Justice. 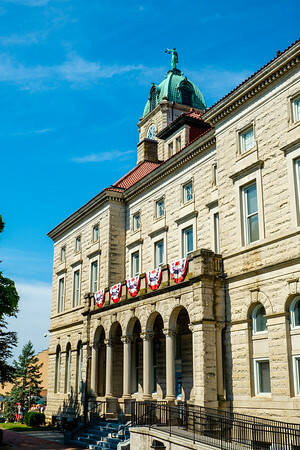 The prominent position and overall size together with the architectural design of the building combine to make the courthouse the county’s grandest architectural statement. The pride with which citizens regarded the new courthouse at the time is reflected in the speech of Judge John Paul at its dedication in September 1897. He called it “a monument to the energy, industry, and progress of the people of Rockingham …”. 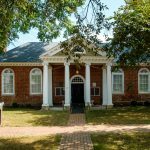 Fittingly, the Rockingham County Courthouse was listed on the National Register of Historic Places in September 1982. 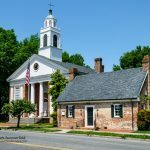 The information for this post comes from a second-hand book I was lucky to find on Amazon – Virginia’s Historic Courthouses by John O. and Margaret T. Peters. This book was first published in 1995 by the University Press of Virginia. 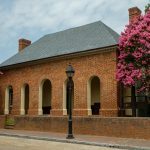 It talks about 110 courthouses in Virginia’s counties and independent cities. The Rockingham County Courthouse was built in 1897. 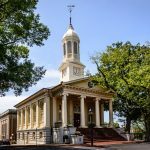 It is located on a prominent site in the square in the center of Harrisonburg, Virginia.